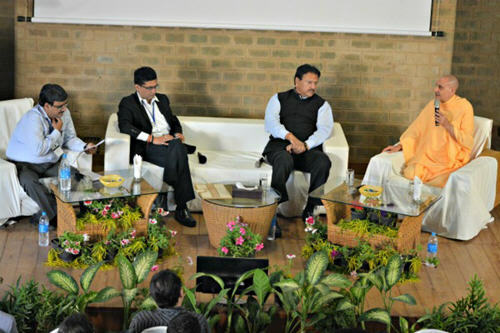 On the 10th and 11th January 2015, 130 industrialists and corporate leaders from around the world converged at Govardhan Eco Village to participate in talks and panel discussions that concerned the ‘Confluence of Vedic Wisdom and Modern Business’. The conference was organized by Artha Forum, an online community dedicated to raising awareness amoung professionals and business leaders of the relevance of ancient wisdom and literature in modern business. Radhanath Swami guides the forum’s activities. Compassion was the keynote of most of the proceedings. During the panel discussion entitled ‘Art of Real Giving’, founder of Kalinga Institute of Social Sciences (KISS) Dr. Achyut Samant expressed, “Spirituality is the best means of inspiring people to do good to society. Radhanath Swami should introduce spirituality to the privileged, to inspire them to share with the needy.” KISS is the largest residential institute for tribal children in India that provides education to 22,500 extremely underprivileged children – from their kindergarten to post graduation. The CEO of Bombay Stock Exchange (BSE) Mr. Ashish Chauhan participated in the panel discussion ‘Spirituality – a Compass for Business?” BSE is among Asia’s leading stock exchanges, and the world leader in terms of number of listed members. Mr. Chauhan took the opportunity to launch a new project of the BSE that will facilitate the not-for-profit organizations in finding prospective corporate donors. Banker turned environmentalist Dr. M.B. Nirmal, who is reputed as ‘a crusader who can change India’, lauded the achievements of Govardhan Eco Village in environmentalism, during the panel discussion entitiled ‘Financial services – beyond greed and speed’. Deputy Governor of the Reserve Bank of India Mr. R. Gandhi and the Indian head of HSBC Bank Mr. Sunil Shanghai were the other participants in the discussion. Other participants in the discussions included spiritual leader Bhakti Rasamrita Swami, Patrika Group national head Dr. Shipra Mathur, renowned journalist Mr. Rahul Dev, R K Swamy BBDO chairman Mr. Srinivasan Swamy, Repute Public Affairs founder and CEO Ms. Madhulika Gupta, Prabhat Khabar chief editor Mr. Harivamsh, and Rajshri Media MD and CEO Rajjat Barjatya. Participants also toured Govardhan Eco Village, and for many that was a highlight of ‘The Confluence’.